CHANGSHA, China, Sept. 28, 2018 /PRNewswire/ — Recently, SANY signed concrete machinery and dump trucks dealership agreement with Rhombus, the powerful ready-mix and bulk cement supplier in Kenya. Rhombus is expected to sell 650 dump trucks and 200 concrete machines in Kenya in the coming three years, which will make SANY’s concrete machinery rank No.1 and dump trucks list No.2 in the local market. Why does Rhombus want to become a dealer of SANY? Recently, SANY excavators got well-known as the green manba in Kenya. In a building demolition project, SANY excavator withstood the collapse of the building with the cab’s glass broken only. The operator fortunately survived from the collapse because of the well protection from the reinforced structure of the excavator. “SANY has extreme pursuit to its products’ quality, which not only improves products’ performance but also safeguard operators’ safety. I want to be SANY’s dealer and make SANY different in Kenya,” Mr. Evanson added. Mr.Evanson has the ambition to make SANY the No.1 construction machinery brand in Kenya. 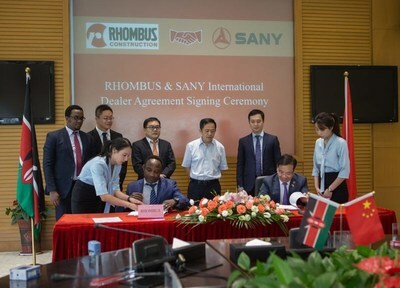 To achieve the prospect, Rhombus shall absorb SANY’s advanced IROOTECH system and open hotline to update service quality; build workshop and exhibition hall according to SANY’s standard; meanwhile, take over SANY’s parts warehouse in Kenya and make plan to set up reliable parts store for existing and new clients. On top of those efforts, SANY will also provide professional assistance to Rhombus in marketing system construction, service policy making and parts warehouse planning. IROOTECH, a high-tech enterprise incubated by SANY Group, signed its first cooperative agreement in Africa. It will collect operation data through Internet of things technology, updating the real-time data of machinery working situation, reducing the operation and maintenance costs, optimizing the parts management and turnover efficiency for the dealers and end users.